The desk of Charles Dickens--where he wrote Great Expectations, Our Mutual Friend, and The Mystery of Edwin Drood--was purchased by the Charles Dickens Museum in London. The desk is now on permanent public display at the museum. Dickens used the desk at his last home, Gad’s Hill Place in Kent. His desk and its accompanying chair passed down through several generations of Dickens descendants before it was sold to a private collector at a charity auction in 2004. 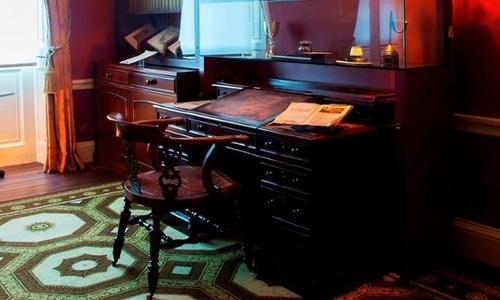 The desk has always been in private hands, however a grant from the National Heritage Memorial Fund allowed the Charles Dickens Museum to purchase the desk for £780,000 ($1.15 million). “We are delighted to have been able to acquire Charles Dickens’ iconic writing desk and chair for permanent display in his study at 48 Doughty Street,” said Robert Moye, director of the Charles Dickens Museum in London. Dickens used the desk at his last home, Gad's Hill Place in Kent. His desk and its accompanying chair passed down through several generations of Dickens descendants before it was sold to a private collector at a charity auction in 2004. The desk has always been in private hands, however a grant from the National Heritage Memorial Fund allowed the Charles Dickens Museum to purchase the desk for £780,000 ($1.15 million). "We are delighted to have been able to acquire Charles Dickens' iconic writing desk and chair for permanent display in his study at 48 Doughty Street," said Robert Moye, director of the Charles Dickens Museum in London. "They hold a unique place in our literary heritage and, as we embark on our exhibition exploring The Mystery of Edwin Drood, it is timely that the desk he used when writing his final novel has been secured for the benefit of all our visitors."